I play my games a quarter mile at a time; and for those ten seconds or less, I’m free. Friday, June 24, Origins 2011: A funny thing happened on the way to the Boardroom. Right outside that gracious hall was a jaunty group of spirited gamers huddled around a long table. They would occasionally hunch over said table, give a little round disc a hearty flick and let out a mighty yawp that I could only assume signified satisfaction. Curious, I drew closer, and soon realized that I was staring down the belly of the beast that has haunted me for many of my gaming years – an agility game. Now, God saw fit to bless me with many talents, but agility has never been one of them; pool tables often fill me with geometric vertigo (the angles are all wrong! ), and I break out in a cold sweat every time I see a Crokinole board. However, this time something inside prevented me from turning around in an all-out sprint. Maybe it was the inviting wooden track. Maybe it was the cajoling calls from the gamers gathered around the table. More than likely it was probably the little pictures of cars on the tiny discs. And so, on this fine Friday in June, I sheepishly cocked my finger, let loose with wild abandon and, with a might yawp of satisfaction, soon realized that PitchCar was going to be in my blood for a very, very long time. I left Origins with PitchCar Mini tucked inside my bag of swag, figuring that it would be far easier to justify purchasing a version of the game that I had grown to love if it was a third the size of the original. My only fear was that the smaller discs and shortened track of Mini might not live up to the rush of the original. As soon as I got it home, laid out the track and introduced it to Monkey238, my fears vanished. As a bonus, my wife was soon hooked on the game, as well. 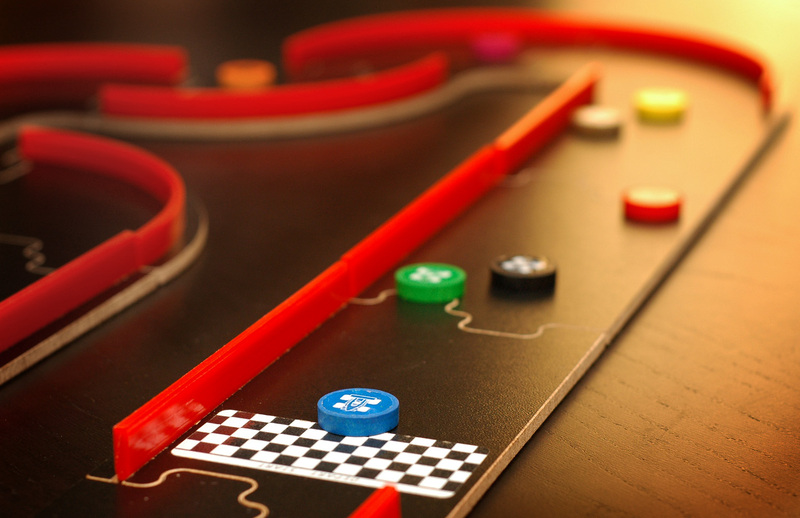 As an introduction to the uninitiated, PitchCar is a racing agility game. 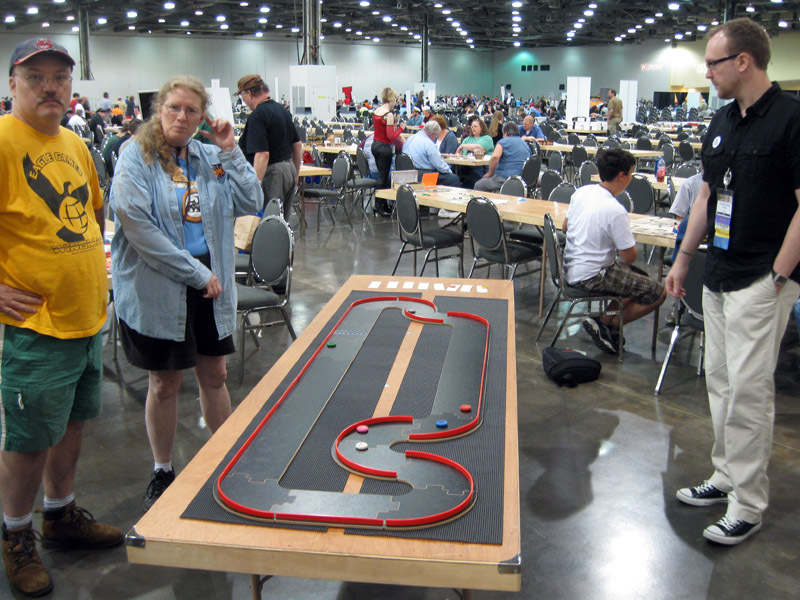 A wooden track, complete with fast straightaways and winding curves, is constructed on a table or floor, and players take turns flicking – or “pitching” – a small, wooden disc around the track. This wooden disc represents the player’s race car. The usual racing rules apply – be the first to get your tiny racer around the track and across the finish line after three laps to be the winner. And that’s pretty much it. Puerto Rico it’s not, but if every single game was a brain burner, my bulbous noggin would soon be mush. PitchCar does have a few standard rules. Bumping other cars on the track is allowed (after all, “rubbing’s racing”), but if your car knocks an opponent’s car off the track, the opponent’s car is placed back on the track, and you must return your car to the spot of the last pitch. Wily opponents can really use this to their advantage as they jockey for a position just in front of other cars, hoping to get a healthy bump up the track in a sort of reverse drafting. Cars also cannot flip over during the race; any car that flips during a move must return to the spot of the last pitch. This is usually accompanied by a brief, hushed expletive. The lively and open gaming environment of PitchCar makes creation of variants and house rules all too easy, and almost compulsory. Since introducing the game to my lunchgames group, we’ve already adapted the game to accommodate team racing, complete with drafting for teammates, and often-nefarious blocking actions for opponents. I also bought Extension No. 1, with jumps that add a whole new level of "holy crap how did you do that?" 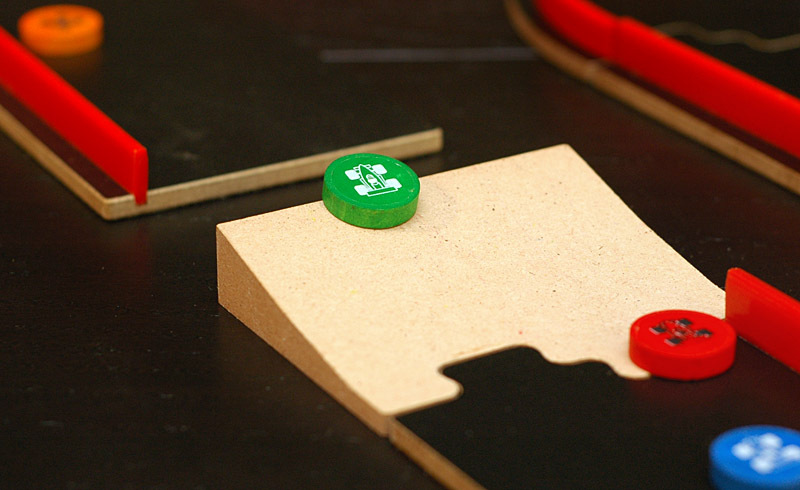 Many fans of the full-sized PitchCar game have lamented the size and weight of PitchCar Mini’s tiny wooden racing discs, claiming that they tend to spend more time on the floor than on the track after flinging off during a high-speed turn. Having played both versions, I can say that the discs in PitchCar Mini are a bit more squirrelly than those of its full-sized brother, and accuracy can be a bit affected. However, once players accustom their flicker to the right amount of force, most players won’t be disappointed with their tiny wooden racers. Overall, there aren’t many games that I can readily say have restructured my thinking about a genre like PitchCar. There also aren’t many games that I can readily say have been worth every penny I paid for them – and PitchCar isn’t cheap. For this particular gamer, PitchCar Mini creates the inconceivable: it packs all the thrill of sport and the camaraderie of tabletop gaming into a powerful, pint-sized package full of fast and furious fun. With rules so simple and mechanics so accessible that any yahoo can step up and be competitive (and this yahoo would know), PitchCar Mini is the perfect game to introduce to people who typically don’t like games. Replay value is stratospheric, as players can create tons of track configurations and hardly ever tire of racing their favorite (and most advantageous) courses. The theme is racing, what’s not to love? 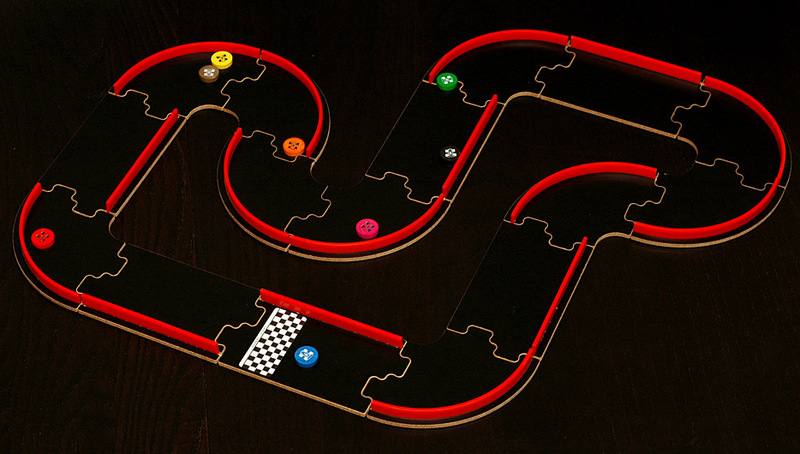 As for the components, the game is pricey for a good reason - the track is constructed of thick, sturdy wood composite, expertly cut to fit and stay together during a race. This is quality gaming at its finest, so potential buyers should rest assured that they are getting their money’s worth. The only drawback to the components are the plastic rails that insert into the wooden track. Although the rails fit snuggly into the slotted grooves, they have a tendency to pop out mid-race, forcing a white flag for track maintenance. We took PitchCar Mini to my mom’s over the recent holiday weekend, and broke it out on a whim. Within two games, she was fully addicted. By the time we left, she was already searching online for a copy for herself. And she’s not alone in the addiction; there hasn’t been a single person that I have roped into a game that, by turn two, hasn’t been smiling and letting out a mighty yawp of satisfaction, pitch after pitch. Overall score: 17 out of 18 - Copies of each print run sell out quickly, so you’d better race to your favorite store! PitchCar Mini is a game for 2-8 leadfoots, ages 8 and up, by Jean du Poël for Ferti and distributed by Eagle & Gryphon Games. You can purchase it online for $54.99 at eaglegames.net or at your favorite local game store. 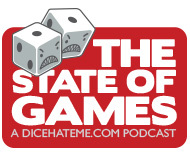 Damn you, DiceHateMe! Now I want the game and I have avoided it for a LONG time. Time to start saving the pennies.